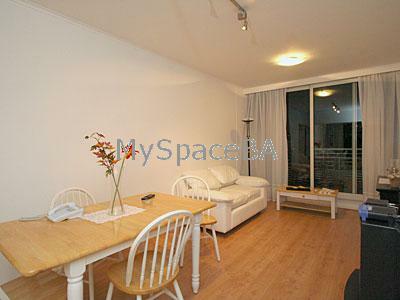 Very nice two bedroom apartment located in one of the most well to do areas of Buenos Aires: Palermo. The parks of Palermo are only a short walk and the famous Av Libertador is only 50 metres away. The building is beautiful and has security 24 hours a day. The apartment has a living dinning room nicely decorated with a balcony with an open view to the River Plate. The master bedroom is spacious with a queen size bed . The second bedroom has a divan bed and desk . It has one complete bathroom and the kitchen is fully equipped. The apartment has wooden floor and there are comfortable sofa and armchairs. Central AC and heating system. Stereo System, TV , cable TV. The kitchen has a fridge, freezer, toaster, coffee maker, washing machine and other utensils. All bedding and towels are also supplied. The building has a gymasiun a sauna and a swiming pool, there are also washing machines and dryers available in the building. There is also parking under the building. Included: Electric, the expenses of the building , cable TV, gas and water, telephone.